The Regional Connector Community Leadership Council’s 2nd/Hope Committee, made up of area residents and stakeholders, requested a pedestrian to help bring bring riders from the underground platform to Grand Avenue’s street level. While I’m not always a fan of “sidewalks in the sky” (athough admittedly they tend to make cities look cool and futuristic), I’m a big fan of better connections for people who walk. So here’s Metro’s updated design plans for the 2nd/Hope Station’s pedestrian bridge. The committee found the design attractive and functional without competing with the extraordinary architecture of its neighbors — The Broad museum, MOCA, Walt Disney Concert Hall, etc. — while working well with Metro’s modern system-wide station design. “The committee feels the clean lines and pragmatic design of the bridge will safely connect transit users and area visitors to Upper Grand’s rich entertainment, business, cultural and educational venues,” said Dave Tompson, Co-chair of the Leadership Council’s 2nd/Hope Committee. Metro designers will consider alternatives in light of the comments, so there will be more design work to come before this station design is finalized. I’m not sure what those glass frames are for – room for 6 elevators? 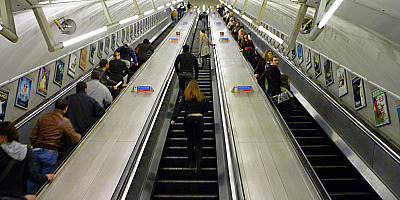 If yes, why not escalators instead? I like it! Beautiful and well done. Are six elevators really necessary? Make it three high speed traction elevators and call it a day. Where is Second Place? And where does it intersect with Hope Street? One way or another, this needs to get built. Otherwise Metro will always be “so close and yet so far” from all of that art and culture. The real question is why do we need a pedestrian bridge? We need stairs, working escalators and a working elevator from 2nd St. to Hope St. (or Grand Ave.) Beyond that, folks can cross at the corners just as we do now. Adding a pedestrian bridge, with its requisite elevators and escalators, just adds a lot of unnecessary cost to this project. Moreover, one would think it obvious that can’t be stainless steel because of heat reasons, if none other. KISS, folks! And, of course, put the names “Museums/Music Center” into the location name — it’s a logical choice. OTOH, LA is going to get a lot more denser in the future with taller buildings, more higher density residential and commercial structures, as well as for mass transit so the need for elevators/escalators is going to be on the rise going forward. Elevators and escalators will become a necessary cost for many buildings and structures in LA going forward. Being said that, if one would to think in the long term, perhaps bringing in elevator/escalator manufacturers (Schilndler, Mitsubishi, Otis, ThyssenKrupp, and Hitachi) and increasing the number of private sector service technicians specializing in maintaining and repairing elevators and escalators, would be a wise decision this entire county needs to do. 3. Is there any other solutions like energy efficient “on-demand” escalators (basically an escalator that doesn’t move when no one is on it, and only turns on when people approach it) that LA can use to lower electricity consumption? For the new underground stations, why are you placing the fare barriers on ground level and relatively exposed to the elements? Don’t you know you’re incurring additional maintenance costs by leaving them outdoors like that? There are computers inside those things, after all. Keep them underground whenever possible where the temperature is fairly constant and they’re not exposed to direct sunlight or moisture. Is this another station design with a nice open plaza but no accommodation for a small, simple kiosk/newsstand style retail site? Of the many stations being built, this isn’t the one best suited for it. But it looks like yet again Metro will miss an opportunity to make a revenue generating amenity that will attract people to the area, serve riders, and make the area safer. The more direct approach is to work together with private-public partnerships and start utilizing these open spaces as places to conduct business such as retail so that will create jobs for those who are out of work and start help getting them off the streets by providing them with stable, long term jobs. Metro can easily build a retail space here, approach 7-Eleven or AM/PM or whatever to add in a mini mart here at a very reasonable rent price (i.e. $500 a month or so), on the condition that they hire homeless vets or so. With just a little tweaked development of their 80+ Metro stations, Metro can become a huge job provider for our homeless population by just utilizing their stations better. The place isn’t large, but it can be enough to add in a small mini mart here that we see at gas stations that helps employ 1-2 people per shift. If you think about it, that’s why gas stations go into the mini mart business; because it’s profitable! No one says Metro can’t go into the mini mart business themselves too. A mini mart at each of the Metro stations will help create additional rental income for Metro, or if Metro decides to do it themselves keep all the profit, help create jobs, reduce unemployment, as well as increase county sales tax revenues for LA County. Is it really so hard to just have a secondary exit on the sidewalk area next to the buildings instead of stranding exiting riders on the traffic island and then forcing them to take slow elevators to go over a sky bridge to cross a street? I know there isn’t wide open areas off the island, but plenty of cities manage to fit extra exits on relatively narrow sidewalks without an issue. This bridge is NOT to allow people to cross a street, it’s to bring people up to the level of Grand Avenue, which is at least 50 feet higher than Hope at that point. I agree that in this case the bridge is not there to separate pedestrians from the streetscape (like the bridges coming out of the Bonaventure Hotel nearby), but to provide a transition that’s much easier for them when moving from one street level to another. I see what you’re saying and it makes more sense in that case. But are they really building a Grand level terrace around both sides of the new Broad museum? Won’t that block the much vaunted exterior facade? Looks like it in the renderings, but who knows how accurate those are. Still smells a bit to me like Metro is getting talked into building an extra convenient into Broad’s pet project. But maybe it will actually be better for peds coming in and out of the station from the east. Most of the problem is because many city leaders, planners, and Metro themselves, are run by older (and dwindling and retiring) generation of folks who do not think like the Millennials (the next generation who will be coming into power and has surpassed the Baby Boomers as the most populous generation). Metro and the urban planners still thinks the vast majority all want to live in homes way out in the suburbs and continue to live the suburb to downtown commute pattern like our parents did. The truth is, we don’t want such a lifestyle. We don’t want to spend our precious weekends doing stuff like tending the garden or mowing the lawn or fixing up the place or spend hours on the freeway fighting gridlock just to commute. We absolutely have no interest in the boring suburban home lifestyle. What I and many Millennials want are to live right where all the action is, right in the city, and OWN (NOT RENT!!!) our own condo. I want stuff near me, without a need of a car, close to mass transit, stop paying rent and actually own it, for a reasonable price (not something in the millions of dollars range). We’re vastly different from previous generations on what we want for our lifestyle. Since we’re going to be taking over politics from now on, I expect many politicians, city developers and urban designers start listening to what we want. Downtowns are increasingly for the 1%, not “Average Millennials.” Newsflash ! Not all Millennials are alike. There are probably just as many working in the oil fields of North Dakota and Texas as there are working for high-tech companies in Silicon Valley. Stereotyping a whole generation isn’t very productive. Every generation has wanted to “live right where the action is” when they are in college. Then they grow up, have families, settle down and move to a house they can afford. There have always been a few who don’t follow that pattern and you are probably one of the few. Emphasis on few. Max, this basically creates a Metro stop for Grand avenue. It is not just making some convenience for the Broad Pet project. Usually I hate ped bridges but this is needed to allow for quick and easy access to Grand Ave. There will still be street level access on Hope as well. LA transit and city planners could learn a thing or two on how the Japanese redeveloped Tachikawa (used to be an US AFB until the late 1970s) into a futuristic city of monorails, walkable, transit friendly mini city with multi-level pedestrian bridges. Everyone knows LA is going to get more populous and more denser, there’s no denying it’s not. People need to face that reality and it would be a smart move for LA city and transit planners to really start studying Tokyo whom have had decades of experience in how to build a city like this in an area size about the same as LA County despite the handicap of having three times the population of LA County. It would be nice if that central plant was moved and that location along with the grassy hill there could be developed into highrise housing or hotel. Too bad the station was not built directly under Grand though. While a mini mart may sound like a good idea it’s concept is in contradiction of MTA policy banning eating and drinking on buses and railcars. At one time there was a huge cockroach problem on buses. It’s concept is used all over the world. Eating and drinking policies can be changed. Philadelphia’s SEPTA had a no eating/drinking policy too but they changed that. Besides, Metrolink nor Amtrak does not have a no eating and drinking policy. Is there a difference in customer behavior or sanitary conditions between Metro riders and Metrolink/Amtrak riders? If Metrolink and Amtrak does not have a no eating and no drinking policy but can keep their trains clean, then that means it’s something Metro isn’t doing right that keeps them dirty. Keeping buses and trains clean can be done so long as Metro invests in janitors to clean them. Yes, that costs money, but that said money again can come so long as Metro finds new ways to increase revenue. A lot of things can be done when Metro can make their money on their own. When you add revenue, you increase opportunities. When you don’t add revenue and all they make are cutbacks, then the service gets worse. Buses and railcars are cleaned everyday. Unfortunately the cockroaches hide within the panels. The RTD/MTA have had to hire professional exterminators to treat buses and railcars. What is done at other agencies is unknown? But deep cleaning each bus or railcar everyday is next to impossible. And it’s not a matter of money but instead a matter of servicing 300 plus buses at each division prior to being pulled out the next day. The MTA is not BBB or Culver City where their fleet is smaller and cease service by 12 midnight. You might not be aware but the AM roll out is not completed until many of the all night service buses have pulled in, serviced, and pulled out again prior to 7:00AM. Where income is lacking is selling ads for the inside of buses. Most of the current ads are MTA related. Another source would be renting selling space adjacent to rail stations that do not sell food or drink instead of allowing them to set up free. Selling of food and drink in public areas used to be illegal. It not only takes up public space but endanger she health of it’s patrons. And in the other spectrum, is that the MTA is also not the Philadelphia SEPTA, Transport for London, HK Citybus, or the Seoul Bus who all faces similar issues of the need to clean many buses as much as the MTA, perhaps more, but somehow manages to keep their buses clean without no eating or drinking restrictions. Reasonable regulations such as such as following LA County Health regulations and having a business license to operate is understandable. A blanket ban for the sake of “public safety” (which is too often used an excuse to advance nanny state laws) is not. Unless one has worked for a transit agency attempting to justify the relaxation of regulations is nothing but speculation. 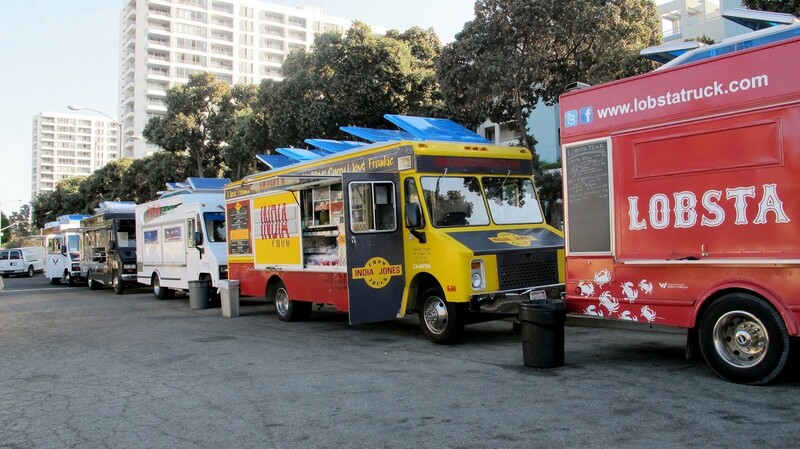 MTA is not the only agency in the Los Angeles area to ban the consumption of food and drink, all the other agencies do as well. 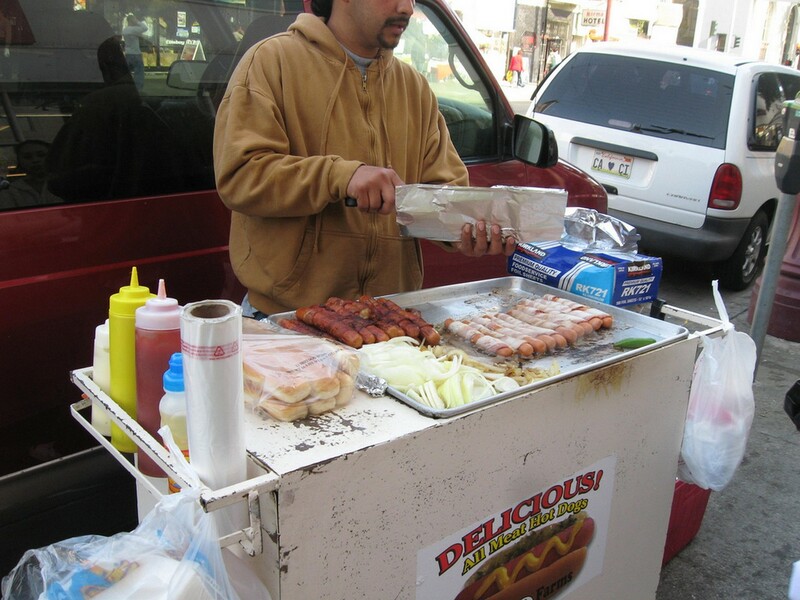 And the photo of a hot dog vender is a great example of a illegal food operation. The majority are not licensed and their standards of cleanliness has much to be desired. 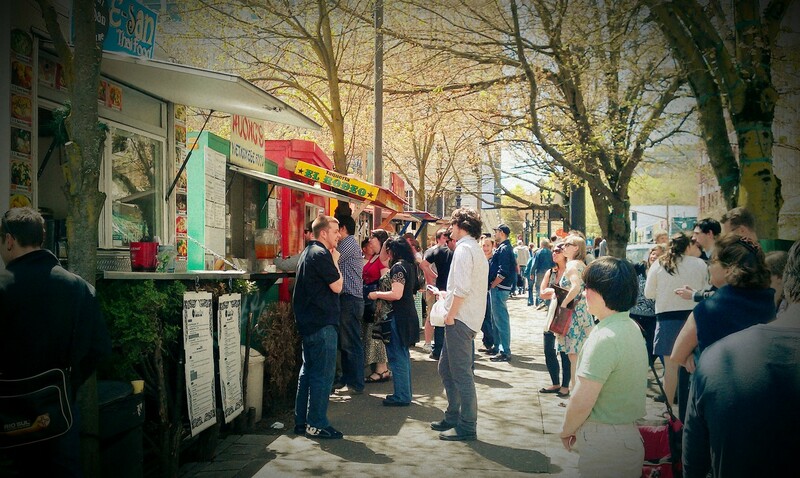 Food trucks for the most part are licensed by both the Health Department and the city they operate in. But I have seen examples of a filthy operation. One food truck vender was banned from RTD / MTA property so he parked in the street blocking traffic. Imagine Twinkees with cockroaches in them. Cans of soda covered in rust. Now would anyone want to eat food prepared on this truck? No one shut him down. he continued in business for years. And would anyone want to sit down on a bus only to find the seat wet with coffee or soda. Or how about a half eaten sandwich on the seat or floor surrounded by cockroaches. Not a pretty sight. Now if this bus was not scheduled to pull-in for over 12 hours imagine what it would look like after these same incidents were repeated over and over again. Or would you advocate pulling the bus in early to be cleaned with a loss of service while it is in the yard? The experts have determined what is acceptable and what is not. And what one might see is not necessarily the accepted behavior promoted by the transit agency. Transit systems all over the world have basic vending going on in and around stations with minor issues. There is nothing unique about Los Angeles to indicate it would be any different here. People like coffee, they buy newspapers, etc. Stations should be public spaces amenable to what people actually do with their lives, not dead zones that people have to shuffle across in order to get back to the city where basic services are offered. Creating dead “plazas” that look nice in architectural drawings don’t work well in real cityscapes. Occasionally someone will spill something. That’s a price you pay for living around other people. This is a great opportunity to build a bike central facility, much like has been done in Chicago at Millennium Park. Provides everything from rentals to repairs, storage, lockers, repairs and showers for commuters. Let’s get going! Why don’t they also add a couple really long escalators? Like they have in the NYC subways that are further down? It is officially part of the project and is funded. They maybe “experts” by LA standards, stack them up to the rest of the world, they’re complete novices. Lest I remind you these are the same “experts” who thought that the honor system was going to work, building them at-grade like it was the 1950s was a great idea, and running them under a flat fare system was a brilliant idea. Besides, these experts’ salaries are paid by taxpayers. We are their bosses. They don’t determine what’s acceptable for us, we tell them what to do. If we want basic amenities like newspaper stands and food outlets and clean buses, that’s their problem to figure out how to accomplish that. Oddly, the rest of the world manages to figure this out, pretty much explains that LA “experts” are novices compared to the rest of the world. Building Light Rail at grade is the standard everywhere which includes the Expo Line and Gold Line. There is nothing wrong with News Stands and Bike Repair but selling food to be consumed on buses and rail is just a unhealthy idea, it causes cockroaches to thrive. I’ll bet you would be the first to complain if you found cockroaches attacking you. The MTA is a 24 hour operation. Those late night buses are only in the yard for about 30 minutes before they are reassigned. And fueling 300 CNG buses takes far longer than conventional buses. And that time is used to clean the buses to the best of the Service Attendant ability. And distance based fares was at one time the norm. I’ve been away from the agency for sometime but I believe some Express Lines still charged by distance traveled. Not only would an additional terminal at the back doors add problems ( B.O. and vandalism) additional dwell time would be added as passengers stopped to TAP their card for a second time and verify they are not being over charged. Lastly I don’t believe the Honor System was a RTD idea. I believe it originated with those from the former LACTC which gained control after the merger although they had no experience running a transit agency.